Early 20th century view of the location. This was at one time, the approximate location of the Hardin and McCrorey Company, owned by J.C Hardin and Company. It was a successful business that sold and repaired buggies, farm equipment, and more. 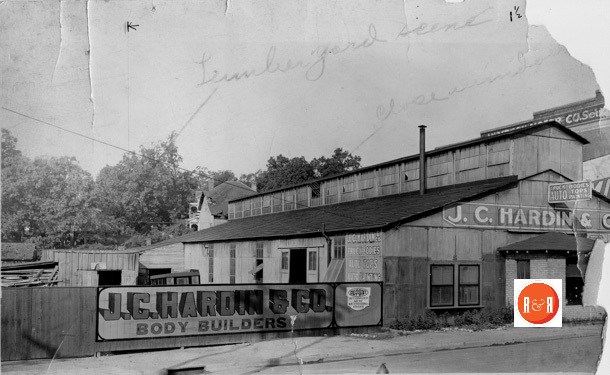 It was from this business that the Hardin family created and grew the Rock Hill Body Company located on West Main Street. Their business flourished during both world wars as well as by providing school bus bodies, utility truck bodies and beverage delivery compartments for hundreds of local establishments. The company ceased operations in the late 20th century. The entire area around the current York County Library building featured agricultural and industrial supply companies as well as several livery businesses. Among those business were the Frew’s Ironworks, which took up most of the space directly across Black Street, where the municipal parking area is currently located. Farmers Exchange or the A.B. Poe Company, one of Rock Hill’s oldest continuously operating businesses, was located in this area prior to moving to South Cherry Road. And the Neely - Moore Livery stables and later their automobile sales business were also located near the library. Dozens of historic buildings and residences were razed along the borders of East and West Black Streets to make room for a new municipal complex, which encompassed the block between: East Black, Hampton, Johnston and South Dave Lyle.